Klikněte na fotografii a zobrazte všechny dostupné fotografie k Guest house Kamburovi. Providing free WiFi, Guest house Kamburovi is set in Chernomorets. The property has a terrace, as well as a bar. The property features a 24-hour front desk. The units in the guest house are fitted with a TV with cable channels. The rooms have a private bathroom with free toiletries. The rooms at Guest house Kamburovi include air conditioning and a wardrobe. 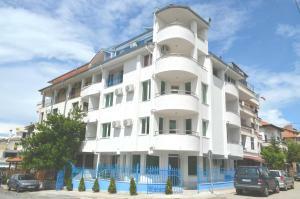 Burgas City is 26 km from the accommodation, while Pomorie is 46 km from the property. Burgas Airport is 36 km away.